This is our first Spring in our new home, and I’ve been busy almost every weekend doing yard work. I’ve cleaned out and replanted 2 bedding areas, plus cut back so many overgrown plants and trees. 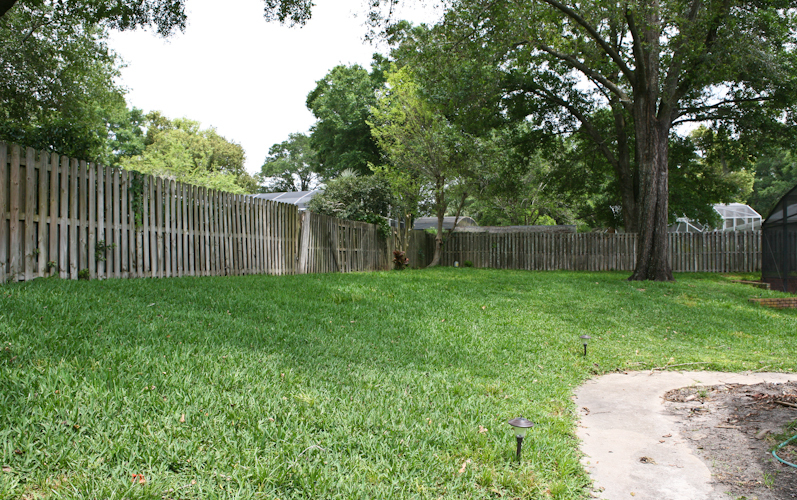 We’ve also made great strides in bringing our St. Augustine grass back to life. We’ve got a few barren spots that I want to re-sod in the next few weeks where the frost killed the crabgrass, but for the most part, the grass has become much healthier with the help of our lawn fertilizer and chemical guy. When we bought our home, it had very mature, very overgrown landscaping. We’ve pruned everything the way it was before. 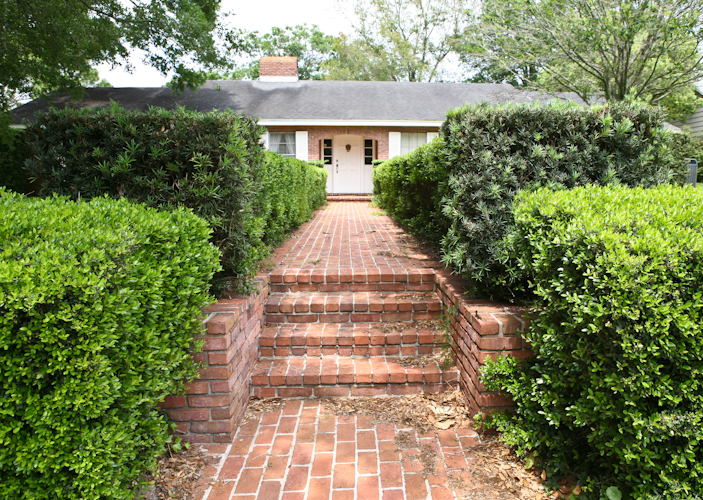 I think the design is pretty formal, the way the hedges line the walkway. 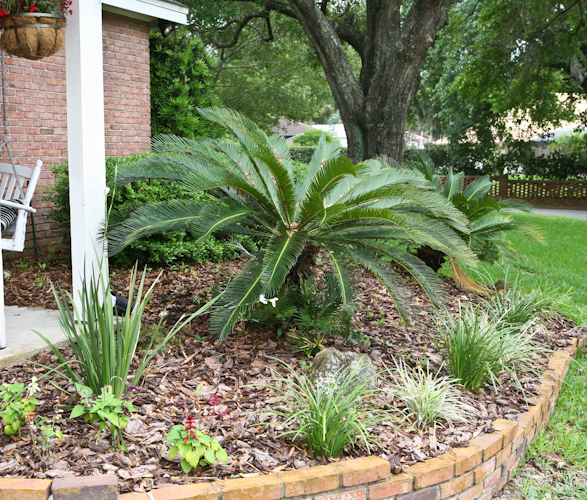 I would love to have some more free form looking plants with more color in the yard. To bring a little more color to the front of the yard, I’ve already added some ixoria and hibiscus. I also pulled those grasses from the shrubs behind them. For some reason they we’re all growing together, so I just separated them and added some mulch. I did this on both sides of our walkway around our little parking pad area. I think by the end of the summer, it will look pretty good. We’ve also put mulch in with some more ornamental grass around my porch kitchen area here. I’m still nursing my sago palms back from their infestation of scale. They’re looking alot better than the did last year. Here’s our planting bed on the other side of the kitchen. Here’s the other side of that bed. The tree in the middle is our Margarita tree, which contains multiple kinds of citrus all grafted together on one tree. It’s sustainable gardening. Using sustainably harvested and plantation grown eucalyptus is considered sustainable since re-grows up to 4-times faster than cypress. It’s natural. 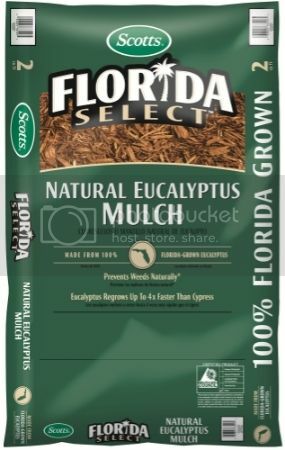 Scotts Eucalyptus Mulch is 100% eucalyptus, free from any construction, pallet or waste material. It’s effective at weed control and water retention, and maintaining soil temperature. And best of all it’s local 100% Florida grown. This weekend I’m working on this area at the end of the driveway. I’m working on this post now, procrastinating going back out there. There were multiple philodendrons that had overgrown to the point that they had become havens for snakes. So out they came. There’s also a crape myrtle off center there that I cut back last month and tons of flowers around it that I’m not sure what to do with yet. Even though we’ve planted a small garden in the back by our house, this is the future home of a group of raised beds for our garden. After this project is done, I’ll be adding some color to the backyard. 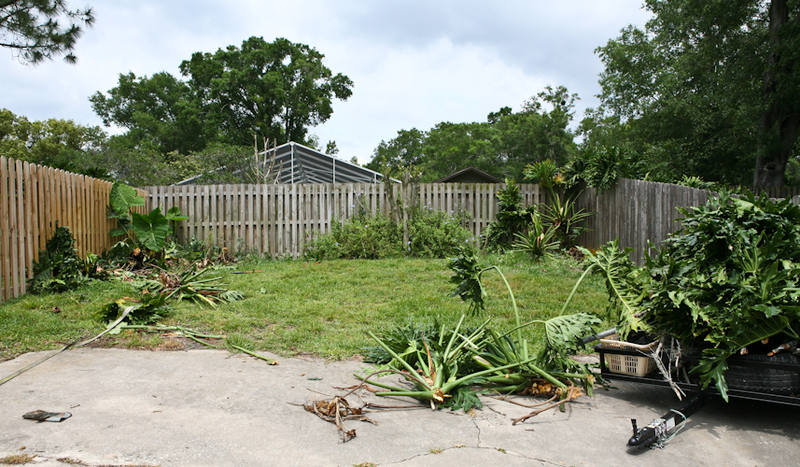 I’ve removed box hedges that were sick and diseased around the pool enclosure. I’m thinking some pretty deep pink azaleas. I’ll also add some color back by the fence. It’s a pretty blank right now, and there’s so many possibilities running around in my head. 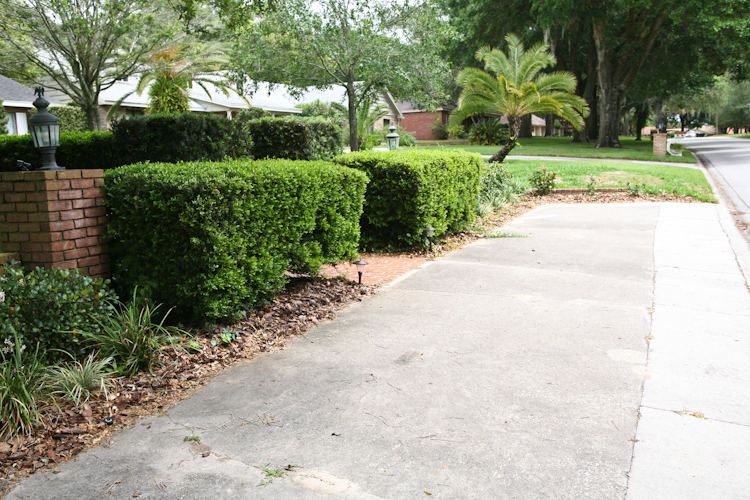 We also need to add some mulch there to the right. That’s the area around my pool pump and heater. For this area I’ve also found another really beautiful mulch, Scotts Nature Scapes mulch. 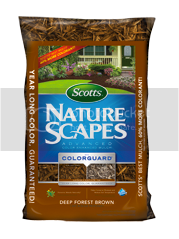 This mulch comes in three beautiful colors to match your home and garden’s color theme. I think I want to go with the black color. It’s so pretty! What a gorgeous place! I am so intrigued by your Margarita Tree! I love what you did to your yard! 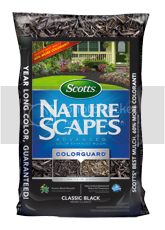 I bet the black mulch would look great! So pretty. I love brick houses. Love what you’re doing!! Nice!! I could use a few more gardening tips. My yard looks pretty sad. Love seeing your house Angie. And don’t you just love yard projects? ha ha. They wear me out, but it’s a good feeling! Love the stairs leading up to your house and the yard is looking great! Once I finished my garden planting we’re onto sprucing up the yard! I’ve been considering getting one of those margarita trees. Do you like it? How nice to be outside doing yard work! We had a couple of decent days, but we’re back to semi-winter again (chilly). Your house looks so beautiful – love the landscaping! Lucky you, getting to work in the yard! I canNOT wait for this snow to leave. You have a very lovely home and yard, can’t wait to see how your plans progress! Do you want to come do our landscaping too? 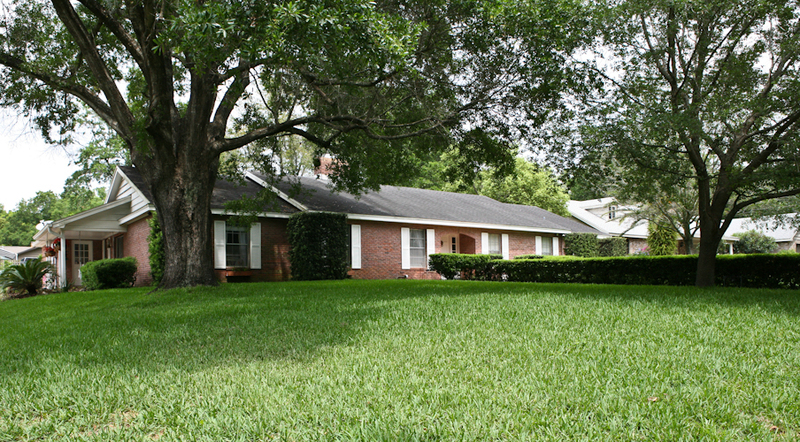 Your yard looks amazing! Angie, Wonderful job on creating a beautiful green space in your yard. 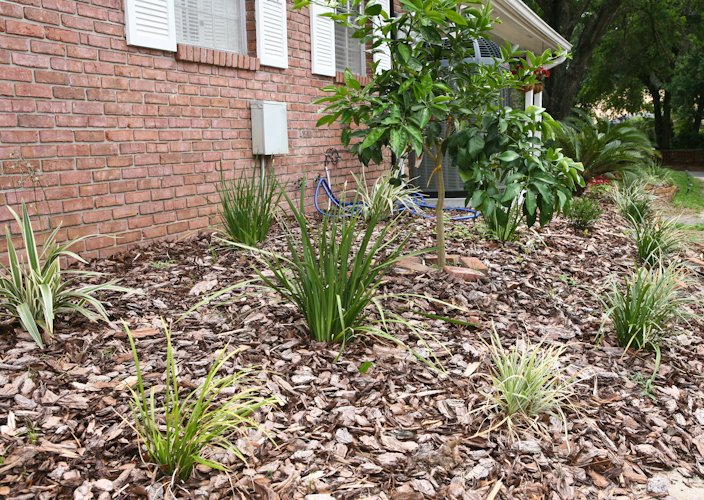 A yard and garden is such a great way to boost the look and feel of your home. It takes some work, but it is worth it!